Could tossing your pizza boxes lead to a hefty fine? 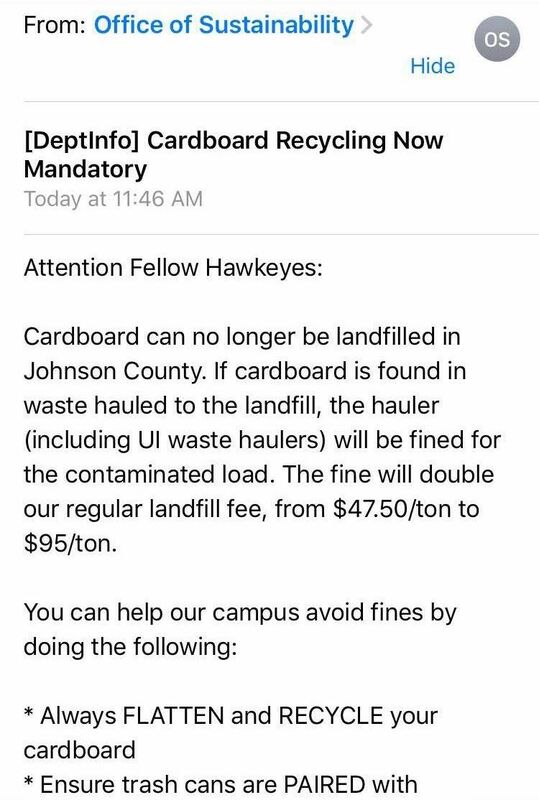 On Wednesday January 17, the University of Iowa Office of Sustainability sent out a mass email stating that cardboard can no longer be disposed of in trash cans, it MUST be recycled. If cardboard is found in a load of trash, the waste hauler will be charged a hefty fine, about double the regular fee they pay to dispose of our waste. Iowa City and the University of Iowa campus need your help avoiding fines for improperly disposing of cardboard. There of tons of simple ways you can do your part! The easiest is to always flatten your cardboard. Remember to put cardboard out with your recycling, not your trash. 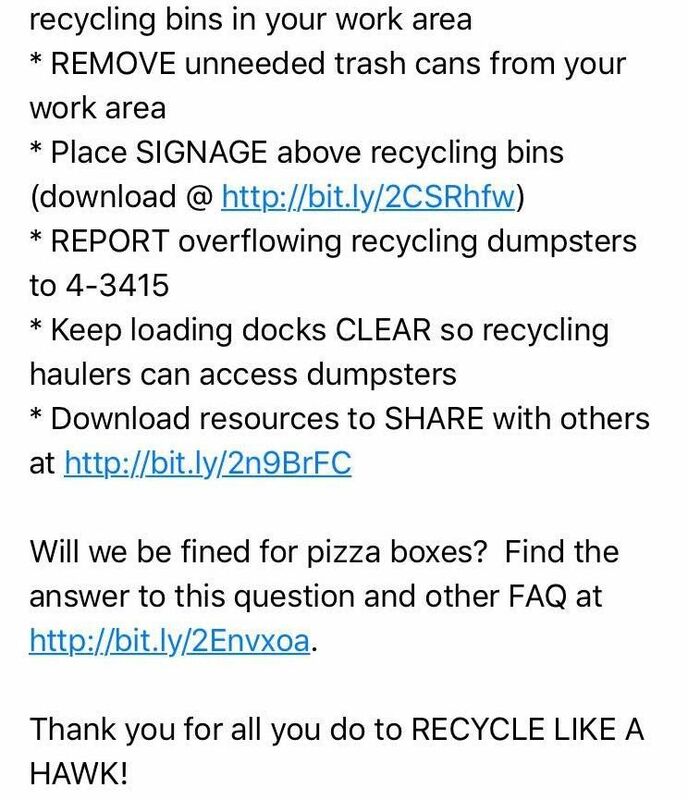 But the question on all of our minds is, will we be fined for putting our pizza boxes in the the trash? The answer is no. Once greasy pizza hits the box, the bottom no longer becomes recyclable. It is recommended you tear the top of the box off and place that in the recycling bin while putting the grease-stained bottom in the trash. Everyone in Johnson County will be affected by the cardboard ban. So, whether you live on the UI campus, are a resident of the county or work within it, we all need to follow these expectations. The ban is active now after a look at a 2011 characterization study which stated that 12% of the items found in the Iowa City Landfill is cardboard. That 12% found in the landfill equals 15,000 tons of recyclable materials. So Hawkeyes, let's start recycling our cardboard. Not only will you avoid a fine for the University of Iowa, your residence or your workplace, but you'll also make a difference in saving the environment. In the end, that's the most important thing to do.